The WAPIS programme held a high-level meeting on the implementation of the regional police information-sharing system. Niamey, Niger: Senior law enforcement officials gathered in Niger to assess the progress of the implementation the West African Police Information System (WAPIS) programme. As INTERPOL is implementing the WAPIS system in four pilot countries – Benin, Ghana, Mali and Niger – the first part of the three-day meeting (23-25 June) saw representatives from law enforcement and Ministries of Justice in the pilot countries and an observer country, Mauritania, discuss issues related to the launch of the regional information-sharing platform. In this process, INTERPOL is offering its support to the countries in developing a solid legal foundation for the implementation of the WAPIS system. With the pilot countries working to set up a national data collection and registration centre and define a clear framework for the establishment of the WAPIS system within their borders, issues addressed during the meeting included data protection regulations and the creation of an autonomous regulatory body. The second part of the meeting was attended by heads of police, gendarmerie and customs agencies from Benin, Ghana, Mali and Niger, as well as INTERPOL, the European Union, the Economic Community of West African States (ECOWAS), the President of the West African Police Chiefs Committee (WAPCCO) and the Minister of Interior of Niger. The law enforcement heads were briefed on the progress of the WAPIS implementation, and each expressed their commitment to advancing the project within their respective countries. 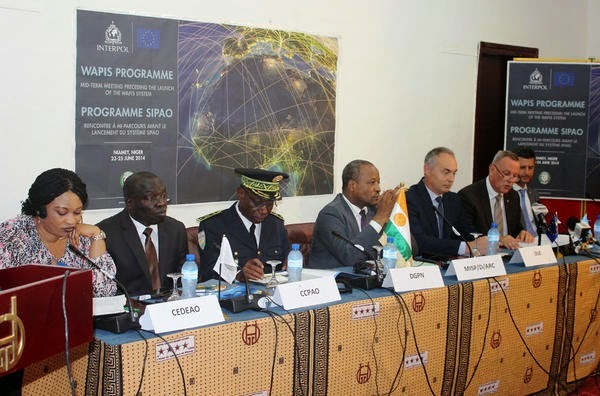 The WAPIS Programme, funded by the European Union and implemented by INTERPOL, aims at setting up national police databases in all ECOWAS member countries and Mauritania, and linking them together in a regional police information-sharing platform under the aegis of ECOWAS.